Createspace Independent Publishing Platform, 9781976382338, 352pp. How can anyone survive this place? The gate of Andersonville Prison slams shut behind Sergeant Stanley Mitchell. Gaunt, half-clothed men surround him. Thieves rob him. The dead are carried away by the cartload. Hope of ever returning to Tennessee and his beloved Anna is suddenly very dim and far, far away. I'll never return to you and you'll never know what became of me. Captured while on "safe" duty behind the lines, Sergeant Stanley Mitchell is forced to endure long months of starvation, violence, and misery at Andersonville-that crucible of humanity that brought out the best and worst in men, Yankee and Rebel alike. Gangs of ruthless Raiders attack and rob the weak and helpless. Food is scarce and the water is foul. Nearly 13,000 Union soldiers-more than a quarter of the men held there-will die. Thousands more will die after they are finally paroled. And every survivor will bear the marks of that place on his body, mind, and soul until the day he dies. But Stanley must not only survive, he must discover how to live amid the squalor. He must see some good amid all the evil, and he must engage in a daily struggle to keep the image of God alive within him, when almost everything without wants to kill it. Will Stanley live to walk out through the gate that shut him in? If he does, the road back to Shiloh and his beautiful Anna will be long and difficult. And if he ever gets there, will Anna still love what remains of her Stanley? 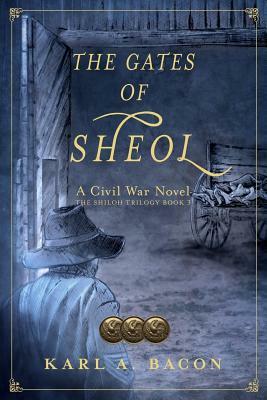 The Gates of Sheol is the final novel of the Shiloh Trilogy. The first, Until Shiloh Comes, has been awarded several honors, including Winner of the National Indie Excellence Award for Historical Fiction and the Independent Publisher Bronze Medal for Best Adult Fiction E-Book. The second, Prairie Dog Town, was the winner of the 2017 Selah Award for Historical/Biblical Fiction and the 2017 Director's Choice Award for Fiction at the Blue Ridge Mountains Christian Writers Conference. From youth Karl A. Bacon has been a serious student of the Civil War. Countless hours of detailed research supply the foundation for each novel, including copious reading, internet research and personal visits to battlefields and historic sites. For The Gates of Sheol, he toured the Andersonville National Historic Site and the Andersonville National Cemetery. Research included reading dozens of diaries and memoirs written by Andersonville prisoners and two detailed accounts of the Sultana disaster. The research provides depth and realism to the stories so that the novels might be as historically accurate and believable as possible. Karl lives with his wife, Jackie, in Connecticut.